Exercises to Ease Knee Pain - Pain.dieutridau.com - All for Pain Relief ! 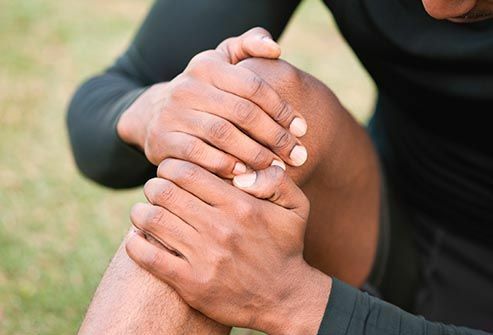 If you have a knee injury, you may worry that exercising could cause more damage or pain. But the opposite is true: Strengthening the muscles that support your knee, and keeping them flexible, is the best way to prevent further injuries. Start slowly, and build your strength over time. Some muscle soreness is normal when you exercise. But you shouldn’t feel more pain, especially in your knee. If you do, stop and contact your doctor. Stretching can help your leg muscles perform better. Warm up before you stretch, though. You can ride a stationary bike for about 5 minutes, take a brisk 2-minute walk while pumping your arms, or do 15-20 wall push-ups followed by the same number of calf raises. It will help you get more out of your workout and lower your risk of injury. If your knee’s not at its best, start with an easy strengthening exercise for your quadriceps, the muscles in the front of the thigh. 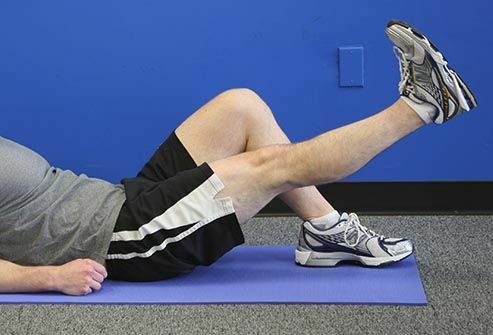 This move puts little to no strain on the knee: Lie on your back on the floor or another flat surface. Bend one knee and place your foot flat on the floor. Keeping the other leg straight, raise it to the height of the opposite knee. Repeat 10-15 times for three sets. Your hamstrings are the muscles along the back of your thigh. Lie flat on your stomach. Slowly bring your heels as close to your buttocks as you can, and hold that position. Do three sets of 15. You can also do this exercise standing while holding on to a chair. If this becomes easy, you can add ankle weights, slowly increasing the weight from 1 to 3 to 5 pounds. Lie on your stomach with your legs straight. Tighten the muscles in your bottom and the hamstring of one leg, and lift toward the ceiling. Hold 3-5 seconds, lower, and repeat. Do 10-15 lifts and switch sides. 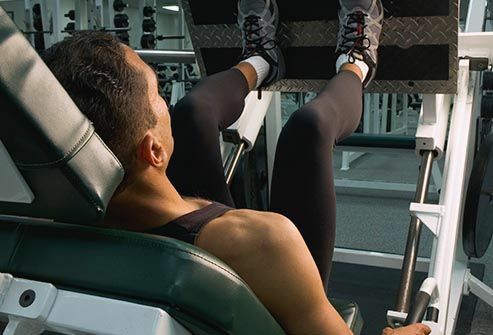 You can add ankle weights as you gain strength. You should not feel back pain. If you do, limit how high you lift up. If it’s still painful, stop and talk to your doctor. Wall squats are “closed chain” exercises, advanced strengthening moves that keep your feet on the floor. Stand with your back against a wall, your feet about shoulder-width apart. Slowly bend your knees, keeping your back and pelvis against the wall. Hold for 5-10 seconds. Don’t bend too deeply or you could injure your knee. If you feel pressure or discomfort in your knees, adjust your position. Repeat the exercise, and try to hold the sit position a few seconds longer each time. Stand facing the back of a sturdy chair, other support such as the back of a couch, or a wall bar at the gym. You can also do this on the stairs, holding on to the banister with your heels hanging off the edge of the step. Slowly raise the heels as high as you can, then lower. Do three sets of 10-15. 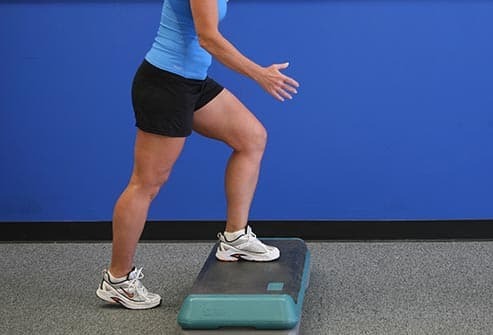 If this move becomes easy, lift one foot slightly off the floor, placing all your weight on the other foot. Place one foot on a step bench, platform, or the lowest step on a staircase. Keeping your pelvis level, bend your knee and slowly lower the opposite foot to the floor. Lightly touch your toe to the floor, then rise back up. Repeat 10-15 times, then switch legs. If this exercise becomes easy, use a higher step, or touch your heel instead of your toe. Lie on one side with legs stacked. Bend the bottom leg for support. Straighten the top leg (without locking the knee), and raise it to 45 degrees. Hold for 5 seconds, lower and relax briefly, then repeat 10-15 times. Switch sides and repeat. Vary the exercise by pointing the toe of your upper leg slightly toward the floor as you raise it. No exercise should ever cause or increase pain. Remember: Muscle soreness after a vigorous workout is normal, but any kind of sharp, shooting, or sudden pain in the muscles or joints is a sign that something is wrong. If you feel pain while exercising, stop right away and check with your doctor. 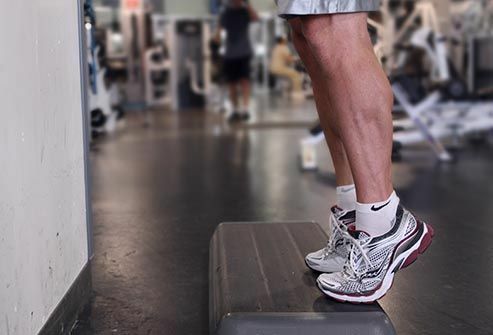 If you have knee pain, avoid exercises that aggravate it. This may include high-impact activities such as running or intense aerobics. Use a common-sense approach and notice what feels right for you. 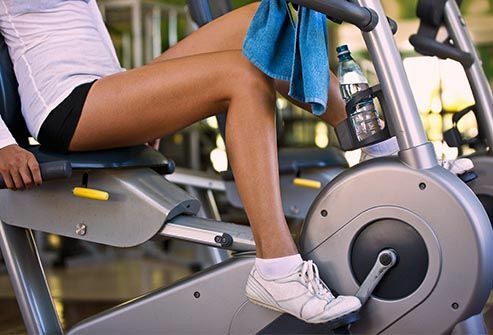 For example, some people find that elliptical machines hurt, while others do not. A great activity for people with sore knees is swimming: Your body in water weighs 1/6 of what it does on land.